Now more than ever, businesses rely on third parties to achieve a wide range of business objectives. Whether a direct supplier to your operations or a critical provider of IT services, these suppliers, distributors, sub-contractors, agents and other 3rd parties play critical roles in business operations. Although identified as a top priority for improvement for many in 2014, many organizations have yet to invest in process and systems improvements to manage risk and optimize spending with these critical Third Party organizations. 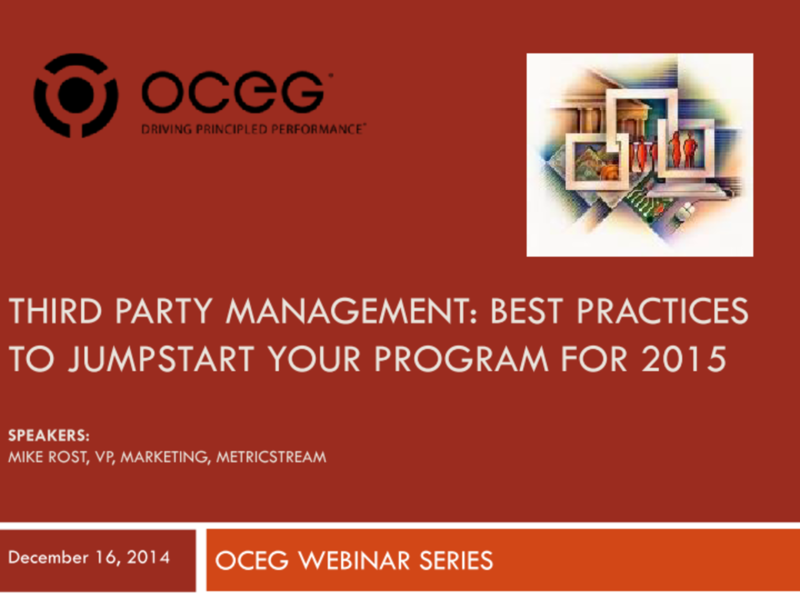 In this webinar, we address the top areas to focus on to jumpstart your third party management program improvement in 2015. Areas of focus will include third party risk management, IT vendor risk management, third party screening & on-boarding, and on-going monitoring, due diligence and review. We have emailed instructions to access Third Party Management Best Practices to Jumpstart Your Program for 2015 Slide Deck to . Make sure the email arrives in your inbox: either add "support@oceg.org" as a safe sender to your email platform, or if you use Gmail, drag our email into your Primary tab.